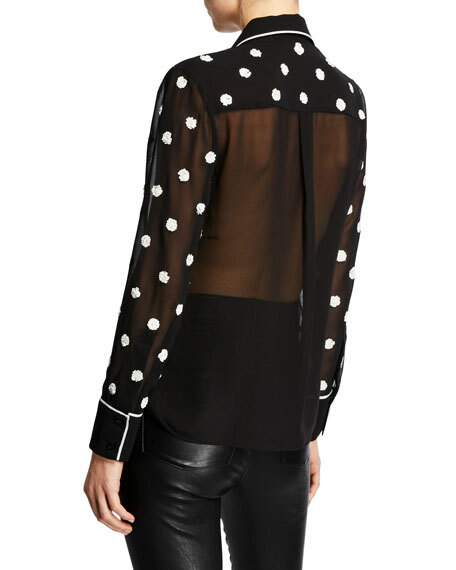 Alice + Olivia "Vina" sheer top with piping & sequin polka dots. 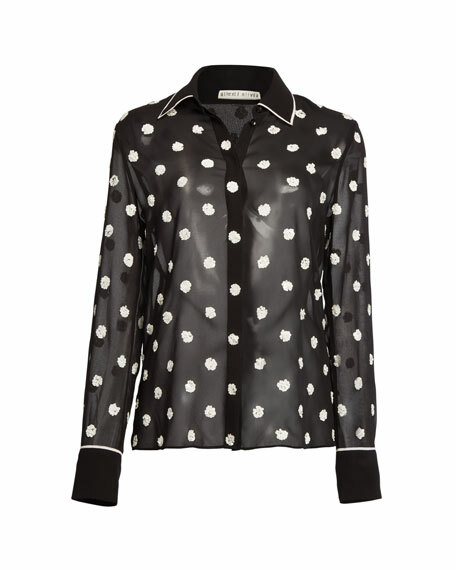 CAMILLA AND MARC "Wren" top with long sleeves. Jewel neckline; sheer yoke; button-keyhole back. Flared, long sleeves. Camisole underlay. Relaxed silhouette. Slipover style. Straight hemline. Polyester self/lining. Dry clean. Imported. Model's measurements: Height 5'10"/177cm, bust 33"/84cm, waist 25.6"/65.2cm, hips 35.8"/91cm, dress size US 2-4/FR 34-36. Joie "Ishana" top in mixed stripes. Crew neckline; button front. Long sleeves. Relaxed, drapey fit. Viscose. Imported. Model's measurements: Height 5'10"/177cm, bust 33"/84cm, waist 25.6"/65.2cm, hips 35.8"/91cm, dress size US 2-4/FR 34-36. Kule "The Hutton" striped top with embroidered smiley face motif. Spread collar; button front. Long sleeves; button cuffs. Relaxed silhouette. Kule "The Hutton" striped top with embroidered smiley face motif. Spread collar; button front. Long sleeves; button cuffs. Relaxed silhouette. Yoked back; box pleat. Shirttail hem. Cotton. Imported. Model's measurements: Height 5'10"/177cm, bust 33"/84cm, waist 25.6"/65.2cm, hips 35.8"/91cm, dress size US 2-4/FR 34-36.